In Japan, the Nissan Skyline GT-R is thought of in the same way that US enthusiasts view the Corvette. Here is why. Like many amazing cars both the Nissan Skyline, now the GT-R and the Chevrolet Corvette had humble beginnings and humble roots. In the very early 1950s Harley Earl and others at Chevy already had the Corvette in mind. While it had yet to produce a model, it would be introduced in 1955, it was on the minds of some of the GM brass. In Japan, only ten years out of a war that devastated the economy, populace and spirit of the nation, Japan was starting to come out of the economic setback it had caused itself. A company called Price, later to be merged with Nissan, had a sporty compact car it thought might make a good platform for something more (Sound like the WRX to anyone?). In 1955 it introduced the Price Skyline. Price soldiered on and in 1964 the Price Skyline, in partnership with Nissan entered a race at Suzuka that gave birth to a legend. At the Japan Gran Prix a modified Price Skyline, driven by Tetsu Ikuzawa actually led a Porsche for a lap after overtaking the Porsche in a turn. Although the Price-Nissan finished second to the Porsche (and also 3rd, 4rth, 5th, etc) the point was that a car form Japan had competed respectably with the best in the world at that time. Interestingly, Yoshikazu Sunato, Ikuzawa’s co-driver that day said that the tires of the racer were “out.” Thus the car had to be drifted through corners. Watch the video and you will see that the car is what has come to be called “loose” in NASCAR parlance. It is a tail-out, over-steering ride. Drifting in Japan, and the entire world, may be traced to this very moment in history. The pride this vehicle generated had an outsized effect. Nissan’s COO, Toshiyuki Shiga was 9 when that race happened. He recalls that year as the start of Japan’s modernization and the race was big news. Paraphrasing his comments, Shiga’s childhood dream became to be part of Nissan. The Skyline and its performance in comparison to the world’s great cars was the reason. 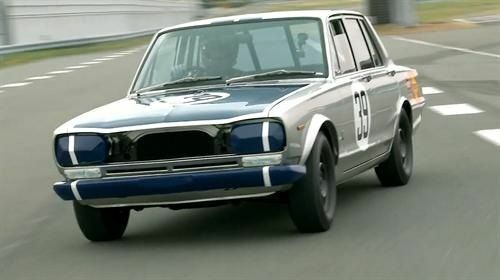 Kazuyoshi Hoshino, a legendary Japanese racer credits the Skyline with being the trigger for the motorsports movement in Japan. Again paraphrasing he says he “Chose this path in life because of the Skyline and the performance in the 1964 Gran Prix.” If all of this has a familiar ring to it, you might be thinking of Corvette’s most famous engineer. Legend has it that Zora Arkus-Duntov decided to join Chevrolet after seeing the 1953 Corvette at New York’s Motorama in 1953*. Like the Corvette, the Skyline’s charisma and potential attracted great talent to the company. The cars also acted as “halo” cars for more than half a century giving brand-loyal buyers something to aspire to. The biggest reason that the Skyline and the Corvette are soul-mates is less objective. When I first visited Japan in the 1990s there was still a thriving car enthusiast culture there. For economic and other reasons it has greatly diminished since then. Then, I was surprised to learn of the emotional attachment that the enthusiasts had to the Skyline, which became known as Godzilla. Although the Supra and the NSX had become international success stories for Toyota and Honda, in Japan the Skyline was different. My fellow enthusiasts held it in high regard even if they were fans of another brand. Much the way a Ford Mustang, or Porsche 911 fan might respect a Corvette and its heritage, even if their personal choice might go another way. Both the Corvette and the Skyline, now GT-R, have matured into supercars at less than super-car prices. That they have endured so long through so many years and different iterations is testament to the early cars and the people they attracted to their companies’. * Lawrence Ulrich, Road and Track, February March 2013, Page 52.